We’ve been hearing about a paperless society for years now. I don’t know about you, but I still have tons of it in my filing cabinets! I’m never quite sure when I can get rid of things…every time I get ready to rid my filing cabinets of the old stuff, I start wavering What if I need it later??? To answer my own question, I’ve scoured the internet for information about how long I should keep my records. Now, I’m going to share what I learned with you. Inevitable, right? One of the biggest questions I ask myself is how long to keep my tax returns. According to Government Services Agency, you should keep them 3 to 6 years. The IRS has the right to audit you within 3 years, but can can start legal proceedings for up to 6 years if they believe you have under-reported your income. And, there’s no time limit on fraudulent returns or if you haven’t filed a return at all. So, bottom line – if you’re honest you shouldn’t need them for more than 6 years. On the other hand, you should never throw out a death certificate or any other vital records, such as birth certificates and social security cards. These need to be kept in a safe place. Safe deposit boxes or fireproof files/safes are good choices. You should keep most canceled (or duplicate) checks at least a year. Credit card receipts can be pitched as soon as you verify your statements. There are some exceptions: if you have canceled checks or credit card receipts/statements that relate to your taxes or larger purchases, you should keep them. For my part, I usually put the tax items in my tax file, so it will get shredded when my tax file goes. For large purchases, I try and keep these as long as I own the item. MIStupid.com recommends this in case you ever need to prove the value of the items. Pay stubs and the statements from your bank or credit union can be kept for a relatively short time. Keep pay stubs until you verify that they agree with your W-2 earnings at the end of the year. Keep your bank/credit union statements for at least 3 months and discard them only after you have balanced the statement and checked that all transactions are correct. Again, there is an exception to this rule – keep your statements on IRA accounts and records of your contributions until you retire or close the account. Keep brokerage statements until you sell the securities. If each statement shows what you own, toss the old one when you get the new one, perhaps keeping the year-end statements indefinitely. I know at my house, this is where the bulk of the paperwork comes from. I’m always hesitant to throw out any bill and must admit that my files are stuffed with BGE and Verizon bills (among others) going back at least a couple of years. As of this writing, I’m turning over a new leaf. The advice I read is that you should only keep the bill until you receive proof of payment. That can be a canceled check or the next statement which shows the payment has been received. After all, the company can always reproduce your bill or statement and you can easily obtain a copy of the check from your bank or credit union. Here at Destinations Credit Union, you can click on the check within online banking and print the image yourself! As you clean out your files, make sure you dispose of personal and confidential information properly. Invest in a small paper shredder and shred everything that you discard. With identity theft on the rise, it’s better to be safe than sorry! Destinations Credit Union is offering a free community shred day on October 22 to help those in our neighborhood get rid of the clutter safely. If you’ve missed this event by the time you read it and you have too much to shred on your own, you can hire a company like Incred-A-Shred (the company we use) to shred in bulk. Carol Szaroleta is Director of Marketing and Business Development for Destinations Credit Union, a full-service, not-for-profit financial institution located in Baltimore, MD. Brought to you by Accel Members Financial Counseling – through financial knowledge and expertise we enable people to enjoy a better quality of life. Whether you are looking for immediate financial security or plan to build a retirement nest egg, anytime is an excellent time to focus on savings. Here are 10 ways you can get started building your emergency fund. Find money to save. Devote any windfalls to savings, including raises, bonuses, birthday checks and tax rebate checks issued by the government. “Walk the Talk.” Commit to putting 10 percent of your take-home pay into an interest-bearing account each month and forget it’s there. Treat it like a bill. Give yourself a due date and a minimum payment and include this critical payment to yourself in your monthly budget. Pretend it was never yours. Set up an automatic deposit to your emergency fund from your weekly paycheck. If you don’t see it, you won’t spend it! Pay yourself for dinner. Skip lunch or dinner out and save what you would have spent instead. Leave yourself a tip. Every time you tip a server, pay yourself the same amount. It may seem small, but it adds up quickly! Get cash back. Round up to the nearest ten when you cash out at a grocery, pharmacy or retail register and slip the small amount into your savings jar when you get home. Keep paying it off. If you recently paid off a big loan, like a student or auto loan, keep paying it, but to yourself. You’ve lived without it this long; you won’t even miss it. Invest in CDs. You’ll earn higher interest and keep your emergency savings just beyond reach, in case you are tempted. Start today. It doesn’t have to be a large sum, as long as it’s something. Small amounts really do add up fast. 1. Shop around for services. Home insurance, auto insurance, gym membership, Internet, cable, cell phone. . . anything you use on a regular basis, pay for monthly or where there are options. Chances are, you can shop around and find a better deal. 2. Look at what you’re using–and what you’re not using. If you have a monthly gym membership but only go twice a month, would you be better off paying an entrance fee, which some gyms allow? Find out what options exist. The same goes for cable, unlimited talk cell phones, Internet access, and anything you can be paying for but not using much. 4. Shop Savvy. 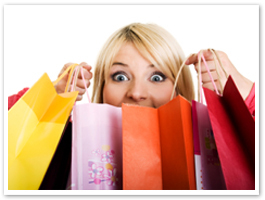 If you enjoy shopping, you can get the same thrill shopping a flea market or yard sale as you would the mall. Enjoy online shopping? Try Craig’s List! You’ll save money and have more fun. 5. Trade lower value for higher value. If you’re paying more for a home, car, clothes, anything that’s not making you happy, consider trading down so you have more money for what you really want it for, whatever that may be. 6. Join the credit union’s holiday/vacation club. You won’t feel the difference every month, but when you get a chunk of change deposited into your account, you’ll have it for something that’s important to you.